The Magic Hutch: Stop The Presses! In preparation for Valentine's Day I have been actively hunting down components for my Valentine's table, not really concentrating on anything else. On Saturday, my sister-in-law came to visit and presented my husband with a bouquet of gorgeous tangerine-colored roses (he had had a very frightening medical issue two weeks prior and had the whole family concerned!). She mentioned that this particular shade of rose had been a favorite of their mother. When she left, I kept looking at the bouquet and suddenly thought, "Those flowers would be a perfect match for the dishes that belonged to my husband's grandmother!" I've had these plates in my possession for a few months. When I started tablescaping, a dear cousin had shared them with me in the hopes they would find their way into a tablescape. So-----there went the plans for Valentine's Day! I immediately changed gears (I felt like an editor at a newspaper yelling, "Hold the Presses!") and decided to start, before the roses began to wilt, the process of developing a table with Grandma Mora's dishes! 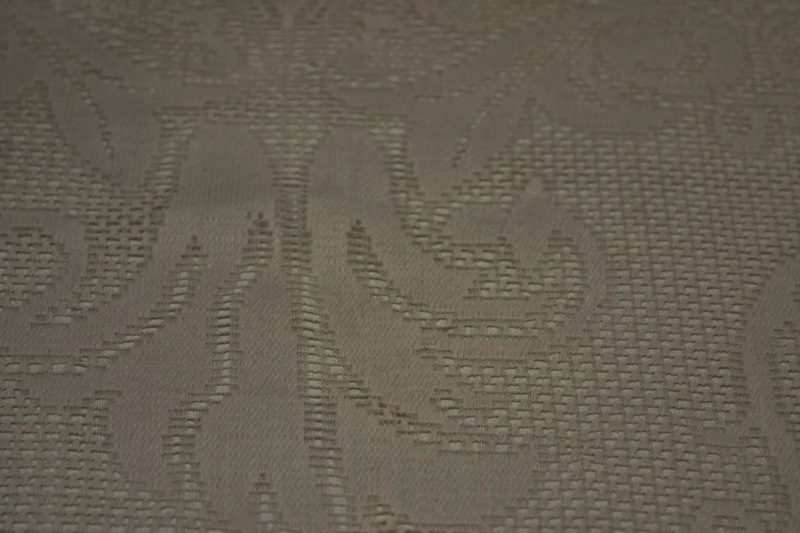 I started with a pale yellow tablecloth that I covered with a lace tablecloth. The pale yellow doesn't show through very well, but somehow I couldn't eliminate lace when the tablescape is dedicated to a Grandmother. Lace and Grandmas go together. I know, because I am one!! My dish stack starts with a gold charger from Big Lots. 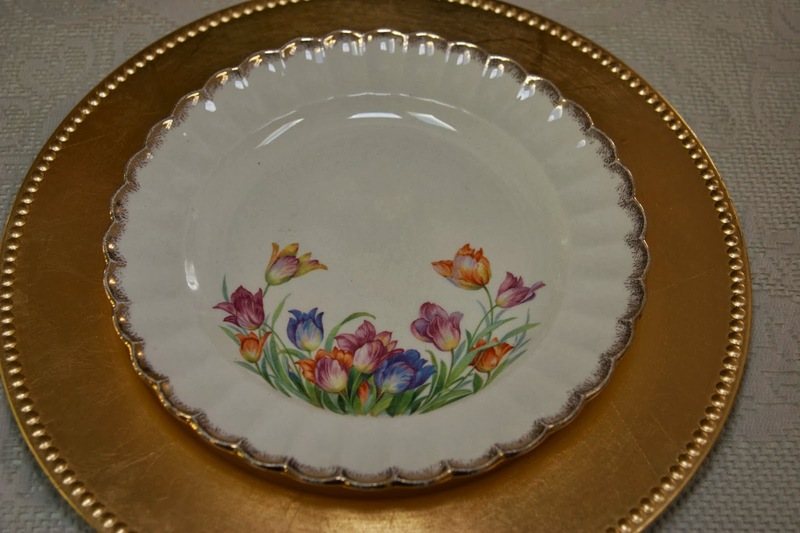 Grandma Mora's plates are edged in gold, and this charger should work well. 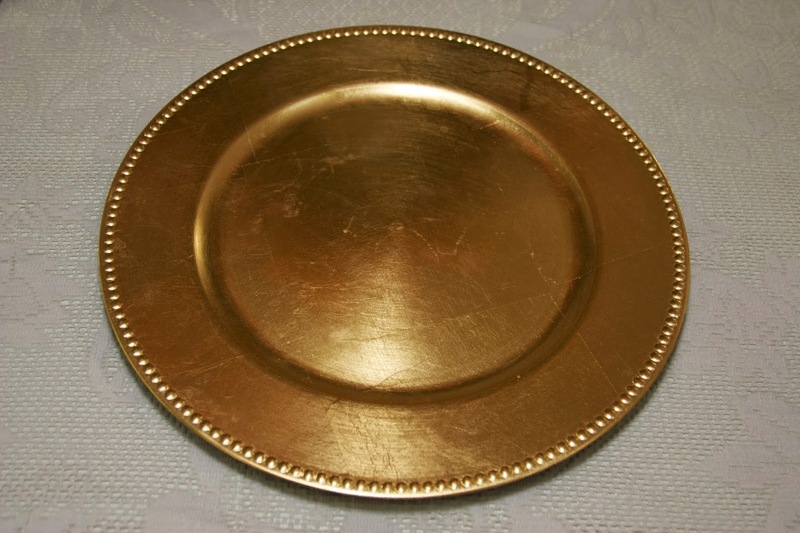 Here is Grandma Mora's dinner plate. It is labeled Golden Ware, manufactured by Sebring in Sebring, Ohio. It is also marked Warranted 22 Carat Pure Gold! Imagine that! The family story goes that there were 9 children in the family, living in Bakersfield, CA. The oldest of these children was Cora (my husband's Mom and my Mother-in-law.) When Cora got her first "real" job she used one of her first paychecks to purchase her Mom a set of dinnerware. This gesture shows the kind, generous heart of my late Mother-in-law, as well as her tremendous affection and gratitude for her Mom, Isabelle. All that is left of the set are four dinner plates and a serving bowl. 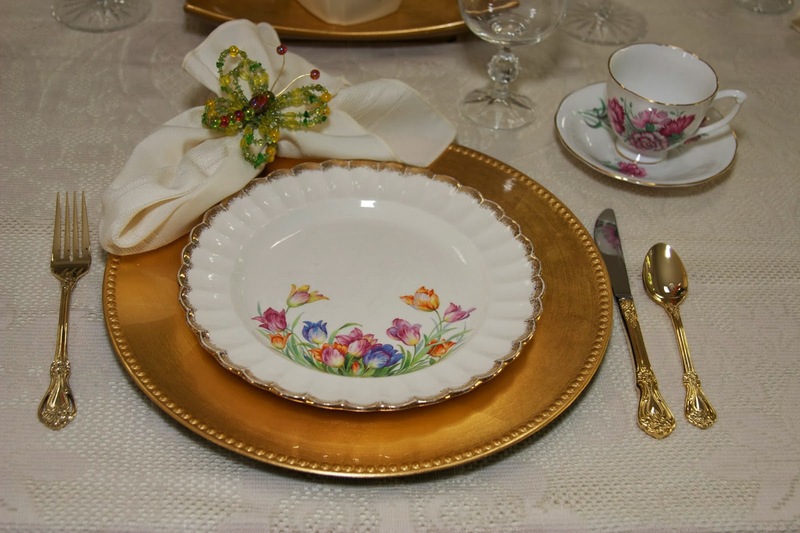 I LOVE the floral pattern on the plates. I'm not well-versed on flower types, so I'd appreciate knowing what type of flowers they are. Could they be a type of tulip? No matter what they are, they sure look lovely dancing in the breeze! The gold trim is still very much intact and it is bright and shiny. Beautiful! If you "google" "Sebring", the historical society in Sebring, Ohio has chronicled the history of this pottery company. 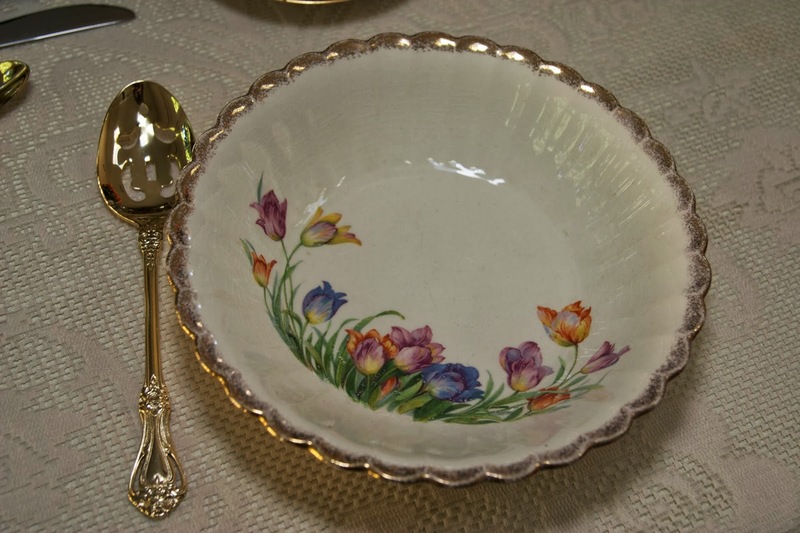 There are some examples of their "Golden Ware" and lovely floral patterns seem to be a favorite theme. The individual place settings look like this. I wanted to keep the linens neutral in color so that the plates would stand out. 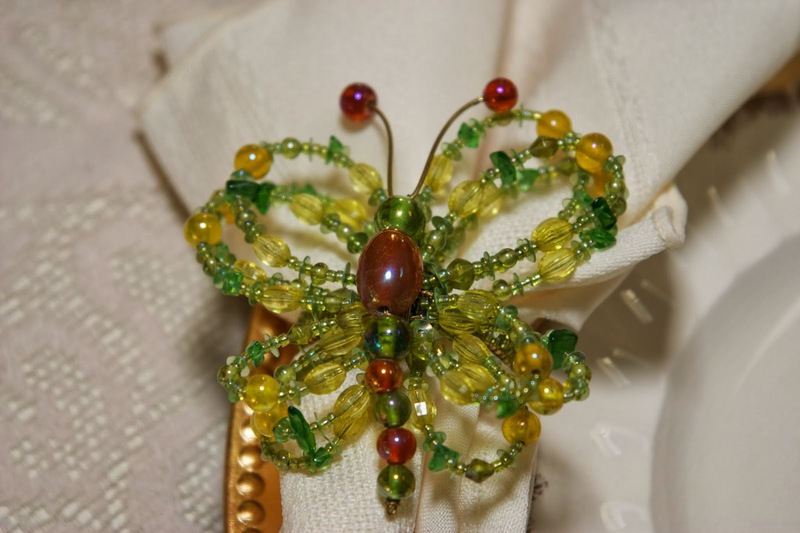 I had a couple of choices of napkin rings, but went with the butterfly (from Pier 1) because it seemed appropriate next to a field of flowers! 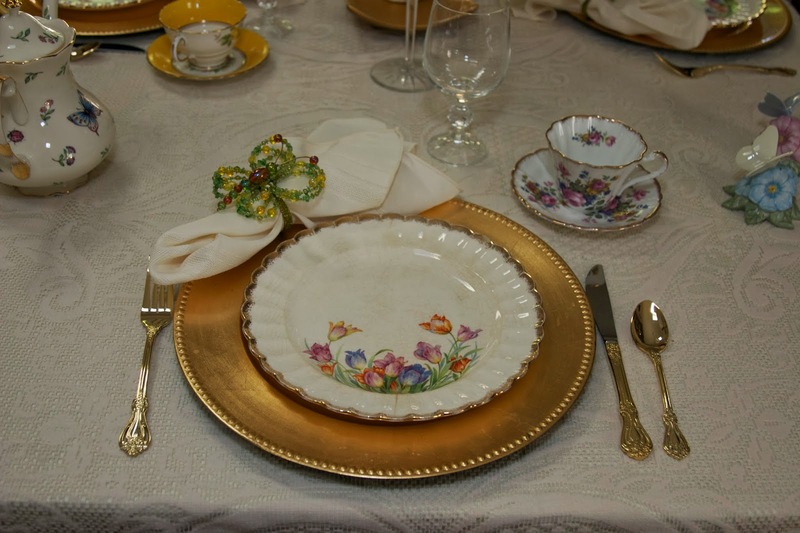 The gold flatware on loan from my cousin completed the setting. 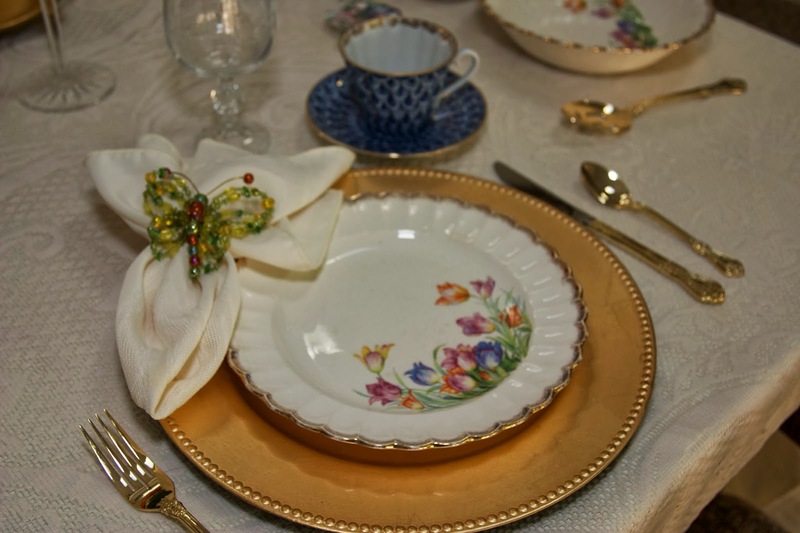 I decided this place setting would be for a tea/coffee party, so alongside a simple Mikasa water goblet, I perused my teacup collection to find four teacups that mirrored the colors of the flowers. I had to add coffee because Grandma Mora was a serious coffee lover, and, after all, this is HER party! 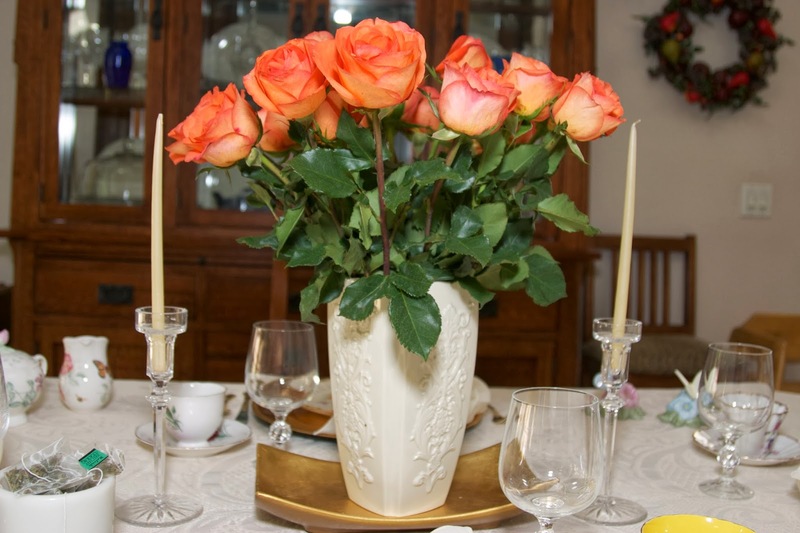 The centerpiece is highlighted by the gorgeous tangerine-colored roses that were the inspiration for this table. They are seated in a Lenox Woodland patterned vase and accompanied by crystal candle holders (a wedding gift from a very special friend) with cream-colored tapers from Williams-Sonoma. Here is the surviving bowl from the set. It is in perfect condition and would be just the thing for some tasty muffins at the party. 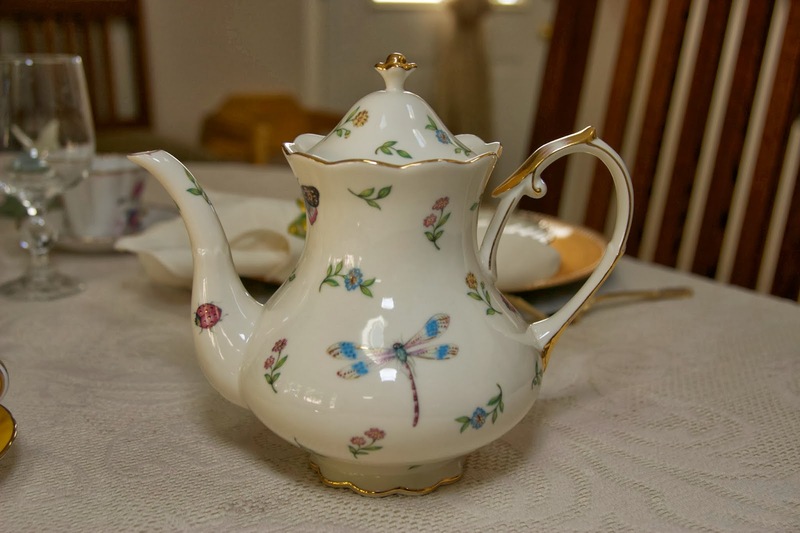 The Lenox Butterfly Meadow creamer and sugar bowl add to the the garden/butterfly theme that this table seems to be taking! I had to add the Butterfly Meadow salt and pepper shakers simply for decoration. Aren't they sweet? A special accent to this table may seem out of place, but had to be included, regardless. This coffee mug was a World War II Corningware mug brought home from the war by the family's beloved, Uncle Chris. He thankfully made it home safely from New Guinea, when so many others, didn't. Uncle Chris was rumored to be the "favorite son" of Grandma Mora, and my husband felt she would be smiling by the presence of his mug on her table. Once again, I am astounded by the power of plates, crystal and linens when arranged together. They have the power to bring to life the memories of the people who sat together at everyday meals and special celebratory gatherings. These plates will be passed down to the great-granddaughters of Isabelle Mora, and they will pass them down to their own children....and so the thread continues. 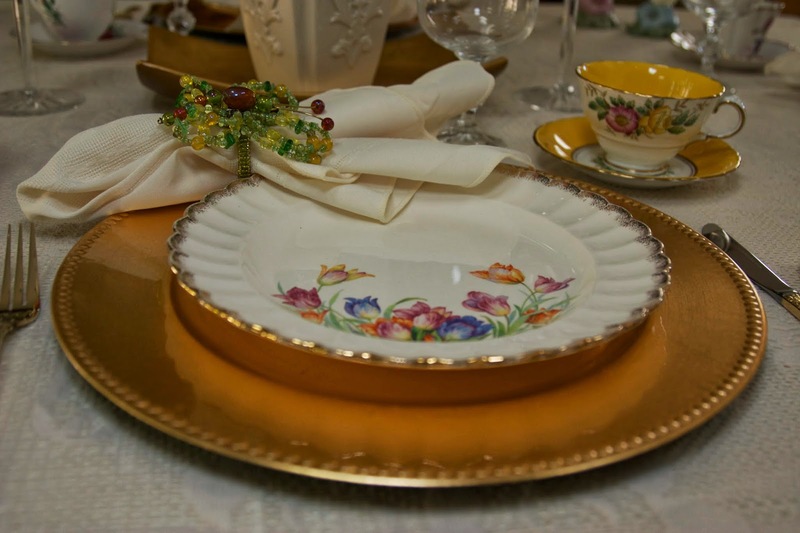 We tablescapers share the secret of knowing how powerful a dinner table can be and what it represents, and how happy we are when all the components come together in a pretty way to honor those who once surrounded a table and used the plates we now admire. Please leave a comment if you have time. I read each one and reply as soon as I can; although you have to come back to the website to read the response. I appreciate the feedback from you. If you'd like to get an email when I have put up a new post, please go to the top of the blog where it says, "Follow by Email", put in your email address and hit "submit"! I LOVE the different kind of roses..my favorite are the lavender ones! This is beautiful. I have to look in my attic for something you may able to use....love you! Where do I start? The flowers are stunning, they are my favorite roses too. Back forty or so years ago I had several of the Tropicana roses bushes in the yard, I loved that color. 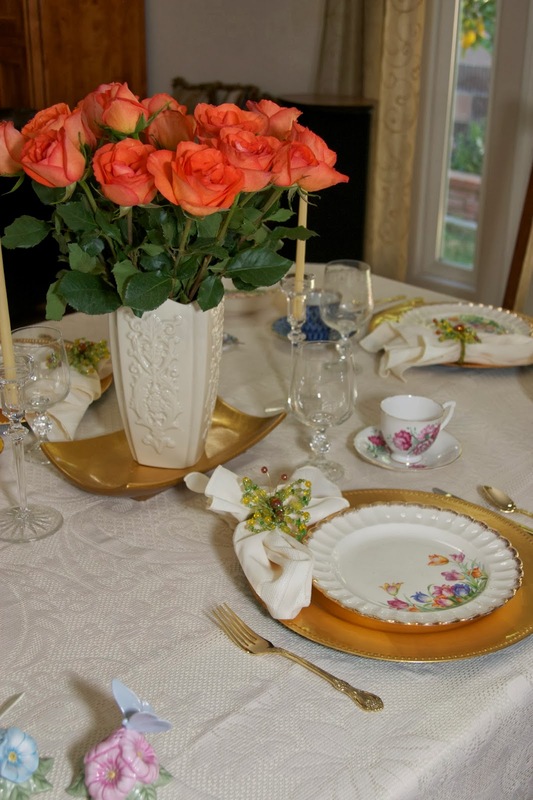 Then your husbands grandmother's Sebring pottery plates are as stunning as the roses. 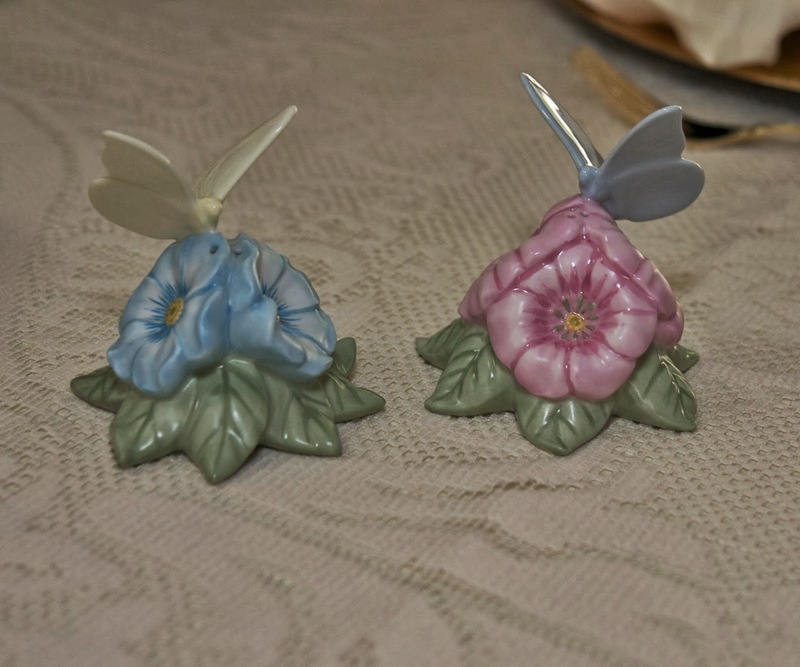 The Lenox Butterfly Meadow S&P shakers, the Pier 1 butterfly napkin rings, The beautiful teapot and the charming teacups and saucers. My heart will be singing Spring for the rest of the day. Thank you for sharing, and and brightening this cold winter day with spring beauty. love your "stop the presses" comment! 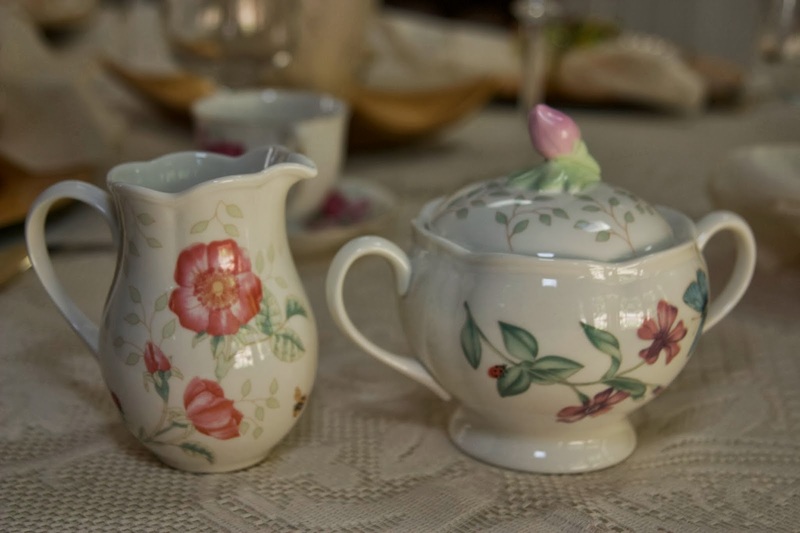 and I agree, it's wonderful to use things belonging to family members that have gone before us, and create memories at the table. It's almost as though they are with us when we eat. Your table is gorgeous!! 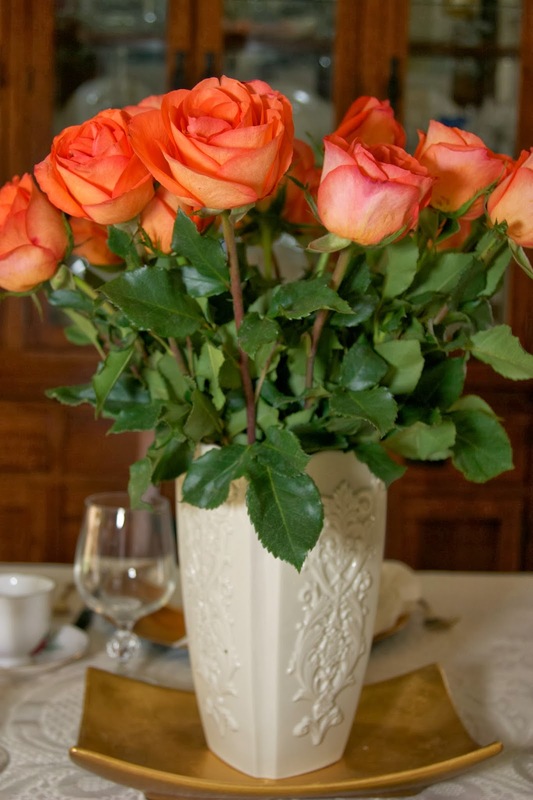 My mom described her wedding roses as "tangerine" color and I imagined them to look like those on your table. She always called them "talisman." I'm not sure if that's their actual name. I love the way you told the story as you put your table together. I like to do that, too. That's what I love most about this hobby. Great job!! Those are very pretty plates! I love what you did with the table. It's really pretty! 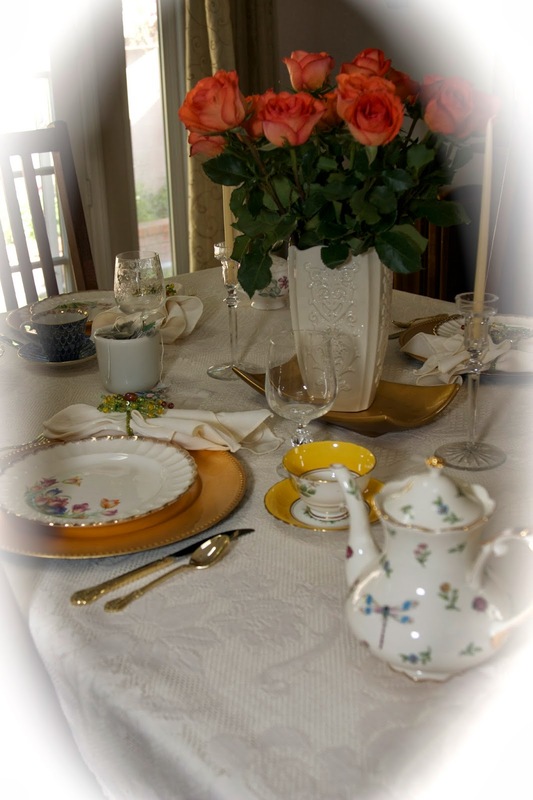 I totally love your sentimental table setting and the historic Sebring dishes you spotlighted. I absolutely love your grandmas dinner plates with the 22 kt gold rims! The pattern is just so pretty and I love flowers. Your entire table is so elegant and beautiful! Thanks for your sweet visit! Your table is lovely. 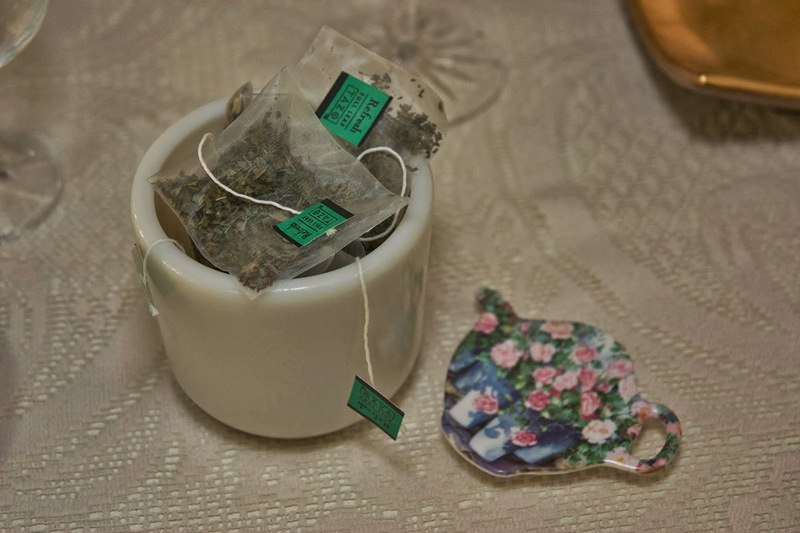 I especially like the plates and the teapot. Oh and the little mall in years added the perfect touch of whimsy. Thanks for stopping by to visit me. Glad that your husband is okay. Rosie, it's amazing how none of it matches, and yet it all matches! If you know what I mean... I think the flowers are Dutch tulips, or parrot tulips? Not sure. Very pretty though, and what a great story of generosity, using her first paycheck to buy them, so sweet. 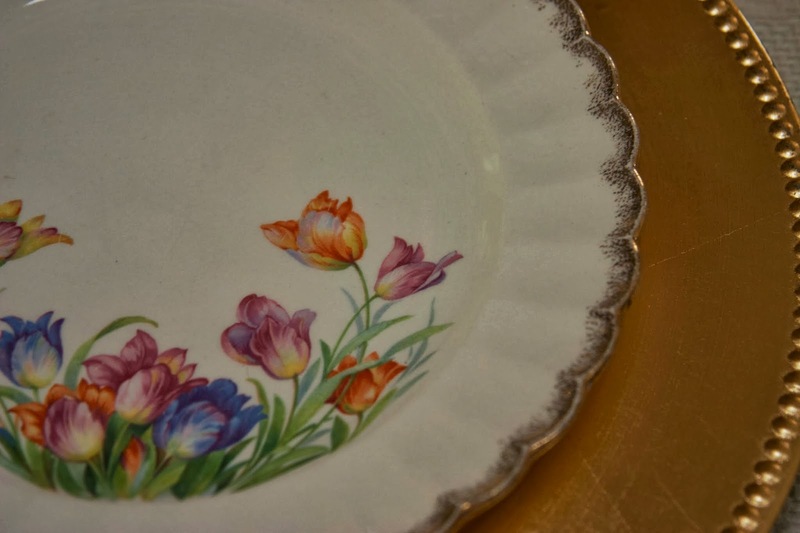 The plates are charming, what a lovely pattern. Yes, these are parrot tulips - such gorgeous colors.